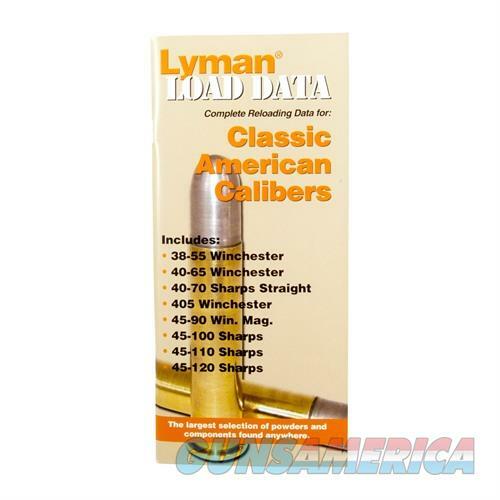 Description: Lyman 9780020 Load Data-Classic American Calibers Easy-to-read and understand data books are filled with information for reloading a variety of popular rifle and pistol cartridges and shotshells. Each book in the series covers the basics of cartridge or shotshell reloading and lists the most popular bullets, calibers or gauges for the featured rounds. Data is provided for a variety of bullet or load weights, propellants, suggested starting-to-maximum grain weights, ballistic coefficient, sectional density, velocity and pressure. All the information you need to work up a new favorite load for hunting, target or competition.